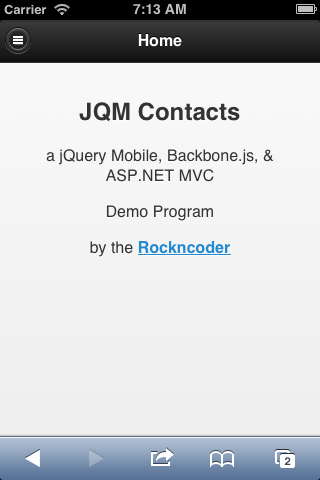 Here is an easy to follow jQuery Mobile tutorial, for those of us that love the power and ease of ASP.NET MVC. It is a simple contact management program. 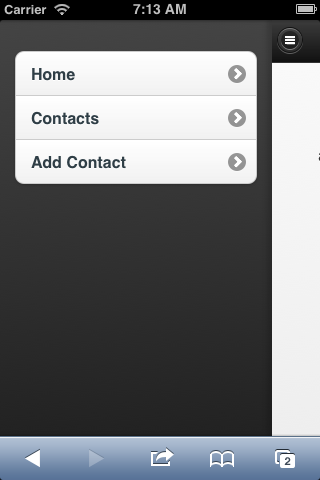 It uses a RESTful interface on the back-end and the latest version of jQuery Mobile, 1.3.0 on the front. I will complete this post later in the week. For now, the source code, like always is on GitHub. It is not working after Publishing the project. I think jQuery Mobile 1.3.0 is not working after publishing the MVC Apps………..
Can you be more specific as to how it is not working? Is it not compiling, does it crash? It is publishing the Mvc project but not applying any CSS and JQuery ………. like white page without Css and script..